Product #15945 | SKU SES-IPOD-AB | 0.0 (no ratings yet) Thanks for your rating! 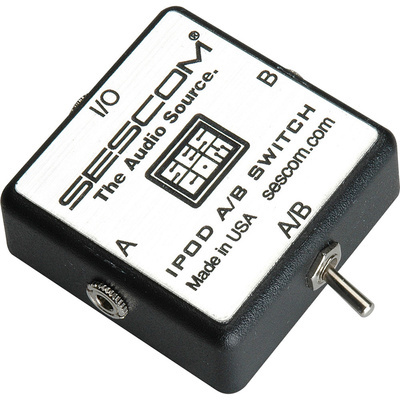 The Sescom iPod Stereo Audio MP3 FLAC WMA Player A/B Switch 3.5mm (1/8) is a bi-directional switch that lets you choose between two 3.5 mm inputs or outputs. If you plug your iPod into the SES-IPOD-AB you can switch between two different outputs, like headphones and stereo, without unplugging anything. Conversely, you can plug two iPods into the SES-IPOD-AB and they'll both run out to the same output, say a stereo. You can then switch between which iPod is being played on the stereo. The SES-IPOD-AB has several other uses as well. It can switch line level inputs to amps, mixers or PCs or switch line level outputs between amps, mixers or PCs. You can switch your PC sound card output between headphones and speakers, choosing to listen publicly or privately without unplugging anything. It's possible to switch your computer output between two sets of reference monitors or simply to bring rear mounted computer mini jacks to the front of a desktop PC. It's also great for recording multiple sources with digital recording software. The SES-IPOD-AB is a convenient tool to have in your studio or home and it also prevents wear and tear on your equipment.